The Syris Vision Enhancement Systems, v300H or the v900L, are excellent devices to midigate the difficulty seeing the superficial veins while using thermocoagulation devices. Both systems offer excellent below the surface visualization and an added benefit is the reduction of glare which can create eye fatigue. Several thermocoagulation devices have been developed over the past few years to treat fine spider veins too small for sclerotherapy or resistant to intense pulse light (IPL). Thermocoagulation is based on a high frequency wave or microburst of energy that heats up the vein. The heat causes the blood in the superficial vein to coagulate causing the vein to collapse. 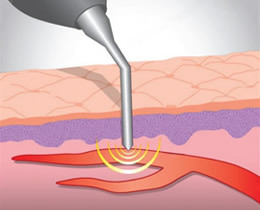 Thermocoagulation can be used to treat spider veins, superficial veins, (medically known as telangiectasia) including those on the nose, facial redness, blemishes, skin tags, cherry angiomas, and depending on the experience of the practitioner, other skin lesions can be treated with this technology.